St. Patrick’s Day, or “I found out I am 1/32 Irish so let’s celebrate” Day, is celebrated all around the world with demonstrations of Irish pride. It is a fascinating holiday in honor of a man who wasn’t even Irish! St. Patrick was born in England to an aristocratic family in the late 4th century. At the age of 16, he was kidnapped and forced to tend sheep in Ireland for the next 6 years. During that time, Patrick became a Christian. Patrick escaped his slavery and was later reunited with his family. After studying for 14 years, Patrick was ordained as a priest in the Roman Catholic church and spent the rest of his life as a missionary on the Emerald Isle. St. Patrick was later honored as the patron saint of Ireland, his feast day celebrated on the day of his death: March 17. Over the years, many myths have developed, the most famous of which attributes St. Patrick with driving all the snakes from Ireland. And while it’s true, there are no snakes on the island, it’s also true that Ireland has never had a native snake population. For many years, St. Patrick’s Day was a small holiday honored by the religious faithful. The first official St. Patrick’s Day parade was held in 1762 in New York City. That parade has become the longest running civilian parade in the world. Today, St. Patrick’s Day represents a day of solidarity, a day to celebrate the culture and folklore of Ireland—which represents the magic within all of us! Hot Springs, Arkansas hosting the shortest parade in the world. At an eternally long 98 feet, the parade showcases Irish Elvis impersonators and other great participants. Wearing a shamrock. A symbol of the spring and Irish nationalism, the shamrock is proudly displayed all over the world on St. Patrick’s Day. Dying the river green. In celebration, the Chicago River is colored green every year with an environmentally-friendly dye. Eating corned beef and cabbage. Corned beef was eaten in America as a cheaper alternative to Irish bacon in order to save money. A large celebration in the Caribbean. St. Patrick’s Day is actually a national holiday in the Caribbean, offering festivities that include street dancing. However you choose to celebrate St. Patrick’s Day, make sure to enjoy it responsibly! We don’t want to hear about any malarkey, like painting a huge shamrock on your friend’s windshield. If you celebrate by imbibing, make sure you aren’t driving home after having too much to drink. 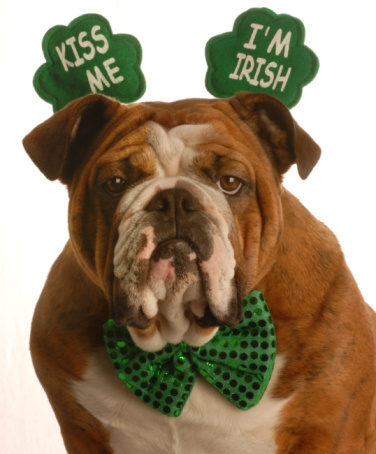 Happy St. Patrick’s Day from all of us at MVD Express!